Yoga classes are being renamed for 2017. 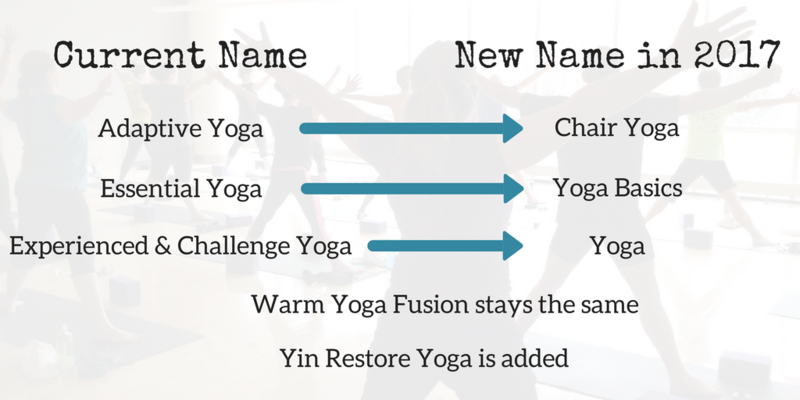 This simplified system will make it even easier for you to choose the yoga class appropriate for you! See image below for the new names. There will also be a new offering, Yin Restore Yoga. In this class, fewer number of poses are held for longer periods of time. This allows for a focused release of tension throughout the body. This class is appropriate for all levels. Make yoga classes part of your new year! 565 1st St SW Rochester, Minn.
Generose Building M-100 Rochester, Minn.